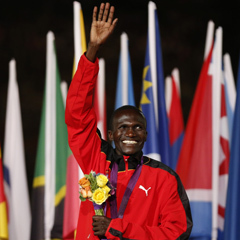 Kampala - Recently-crowned Olympic marathon champion Stephen Kiprotich returned home on Wednesday to a rapturous welcome in Uganda, an $80,000 cheque and a pledge that his parents will get a new house. Kiprotich, who beat the heavily-fancied Kenyan team to claim Uganda's first gold medal in 40 years at the London Games, was welcomed by cheering fans before being whisked to a breakfast meeting with President Yoweri Museveni. Museveni presented the gold-medallist with a cheque for around $80 000 and ordered the money "be deposited on his account before the close of business today," the president's office said in a statement. Uganda's GDP per capita stands at around $500, according to the World Bank. Museveni also promised to construct a three-bedroom house for Kiprotich's impoverished parents who live in a remote area of eastern Uganda, the statement said. Meanwhile, the state-run daily New Vision newspaper claimed to have raised over $120 000 from public and corporate donations for the athlete, and is aiming to collect a total of $500 000, it reported on its website. Kiprotich, who works as a warder in Uganda's prisons, was also handed a promotion from his bosses, a senior official at the Uganda prison services said. "We are promoting him and we will commission him soon," Tommy Ochen, director of correctional services, told AFP. Kiprotich, who was accompanied by his wife and two children, has complained about the lack of funding for Ugandan athletes. Like most of Uganda's top runners, he has been forced to move to Kenya's renowned high altitude Eldoret region to do most of his training.